The sweet potato is widely grown as an annual across the south - yet it's a perennial here in Florida. A relative of the morning glory, the sweet potato is highly nutritious, calorie-filled, packs less of a glycemic hit than grains, cassava or potatoes and stores excellently. However, it doesn't like frost, so you're not going to get any growth during the winter. And don't plant them too early the first year - it's better to wait until there's absolutely no chance of freezing your tender young starts. Speaking of "tender young starts," anyone ever stuck a few toothpicks into a sweet potato from the store, stuck it in a glass, then watched the buds turn into vines? If not, grab a potato and try it. The new vines that form can be broken off and planted in the ground once they get a couple of inches long. The potato will continue producing new ones for months. These little vines are called "slips." Make sure to keep them watered and shaded as they get established. Once they're established, they'll grow like weeds. I know people will tell you all kinds of things about harvest times, etc., but I usually pull sweet potatoes in November... or when I get tired of their vines covering everything. I follow the vines and pull up all I can. Invariably I've left some in the ground that return the next year, and that's fine. One thing I recently discovered is that sweet potatoes are pretty bland until you let them sit and age for a while. When you dig the potatoes, let them sit out for a little while to dry, then put them in a basket, dirty or not. After a few weeks' storage they'll sweeten up. They keep for a long time under cool dry conditions, too. Months and months. I've stored them for six months and still had decent roots to eat, despite what you read about short storage times. 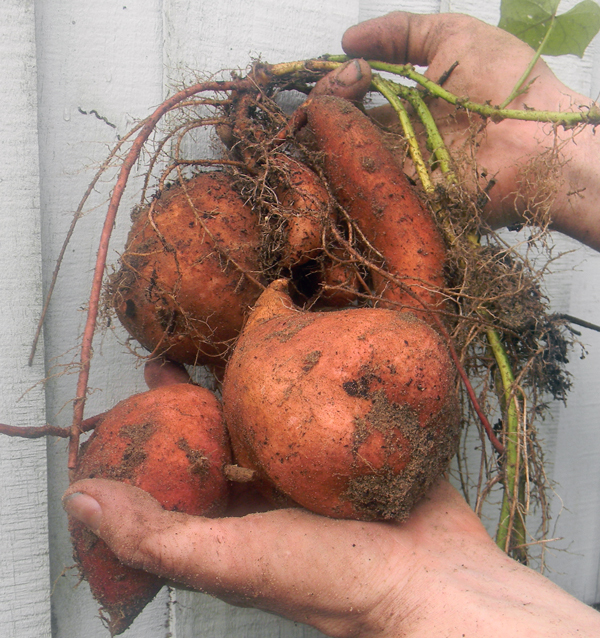 Another benefit to the sweet potato: its leaves are edible raw or cooked. We eat sweet potato leaves in our salads all summer and fall. They don't have a lot of flavor, but they're a great salad stuffer and have a pleasant crunchy texture, provided you don't pick when they've been wilted by the sun. This plant is excellent all around - just don't eat the roots raw. They won't kill you, but they do have some anti-nutrients that are removed during cooking. FYI. 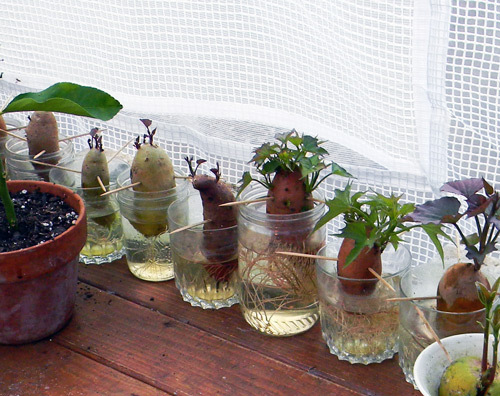 True story: the picture at the top of the little sweet potatoes in water was taken in my greenhouse this spring. I bought an organic "sweet potato assortment" in shrink-wrap at Publix. It was a total gimmicky thing with a few small different-colored roots in a row, selling for the ridiculous price of $2 and change, ready-to-microwave! I thought "heck with that - I can grab about 5 cultivars of sweet potato in one fell swoop and PLANT THEM!" Exposure: Full sun/part shade. Lots of sun is the best. Are sweet potatoes perennial as far north as Ocala? And do you have any info on their resistance to root knot nematodes? I just found this blog and am thoroughly enjoying reading about these crops from a Florida perspective. What zone are you in? Yes - they're a perennial here, though they die back a lot in the winter. I've got them planted here and there through my front yard and they've been coming back for a couple of years. Unfortunately, this far north they're not nearly as impressive as they are further south. It's a better annual crop here than perennial, in my experience. Though - that said - I had it occasionally come back from the roots in the spring when I lived in TN. My deep mulch beds probably helped. According to the new USDA zone map (which is a joke), we're solidly in zone 9. In reality, this is zone 8 some years, zone 9 in others. It used to be zone 8b/9a, which makes more sense. Unlike areas closer to the coast, we don't get much protection from extreme swings. Sometimes it will hit 12 degrees or so overnight, though never for more than an hour or so. Thanks for the info. I think I am going to plant a large patch, harvest a few bushels for the family, and then turn the pigs lose. Your blog got me to doing some additional reading and it turns out sweet potatoes make an excellent forage; some even bale sweet potato hay. It had never occurred to me that the plants would be both tasty and nutritious. That's a whole lotta good in a plant to cheap and easy to grow. What can be done about sweet potato weevils? They are real problem in my garden. I don't want any pesticide spray, so I need some natural solutions if there are any. I am trying to raise as much of my own food in my small yard in St pete, it is amazing how much we can grow here. I will try again on the pineapples, and definately will do the sweet potatoes. I have a few other trees in my yard, a small peach, olive, Barbados cherry, and a peanut butter tree, and dwarf mulberry. I also plant crowder peas, and oh my goshhh they live in the hottest part of summer and produce a dried bean right on the vine. I would love to get in contact with you and possibly share some plants. Just signed up to follow your blog. 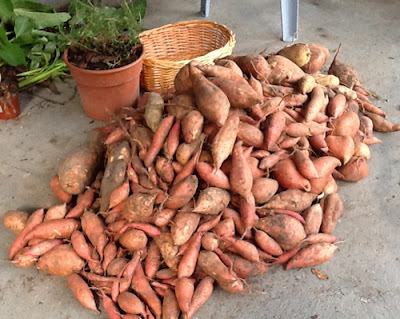 When is a good time to plant my sweet potatoes. I live in the New Port Richey area and will be using a Smart Pot. The variety I use is Centennial, and it produces some of the sweetest ones you'll ever have. One caution though - don't plant them in very loose soil. I tried them in a new raised bed garden that was basically very loose potting soil (you could easily punch your fist down into the soil half way to your elbow). Rather than nice round sweet potatoes, it just formed long thick roots, with the biggest size a bit thicker than your thumb. The taste was there, of course, but you couldn't really cook and eat them. They need some resistance as they form the roots. I transplanted them into a patch of ground that I had covered with a truck load of mushroom compost. It was pretty heavy soil, and it formed perfect sized sweet potatoes. In West Africa, sweet potatoes are also grown as a green, and not just the roots. My understanding is that they actually produce more sweet potato roots when some of the top is harvested and eaten as a salad. I'd like to see a careful study on that to be sure, but I learned that from missionaries stationed in Sierra Leone.